It is hard to believe I am in my last quarter of nursing school before I graduate in March. This quarter my clinical site is the Intensive Care Unit (ICU) at University Hospital. I truly thank God that everything I learned the past 4 years is finally coming together! I am receiving a good review of anatomy and physiology as I spend many long exhausting hours making my care plans for these complex patients. I go to bed at 1 a.m. after finishing the care plan and arise at 5 a.m. in order to get to ICU ready to hear the report at 7 a.m. I have a very nice instructor, Miss B. She corrected me last week after I gave a medicine Intravenous (IV) push without her or my preceptor being present. Earlier in the quarter, she told me to work as independently as possible, but I guess that does not apply to IV meds yet! Thankfully, no harm came to the patient. At the third week, I became filled with anxiety that I would not make it through the quarter because it was so difficult. I pleaded with the brethren to pray for me and claimed Isaiah 40:29. The Lord gave me victory and lifted the horrible depression and sense of defeat. From then on the quarter was fine. 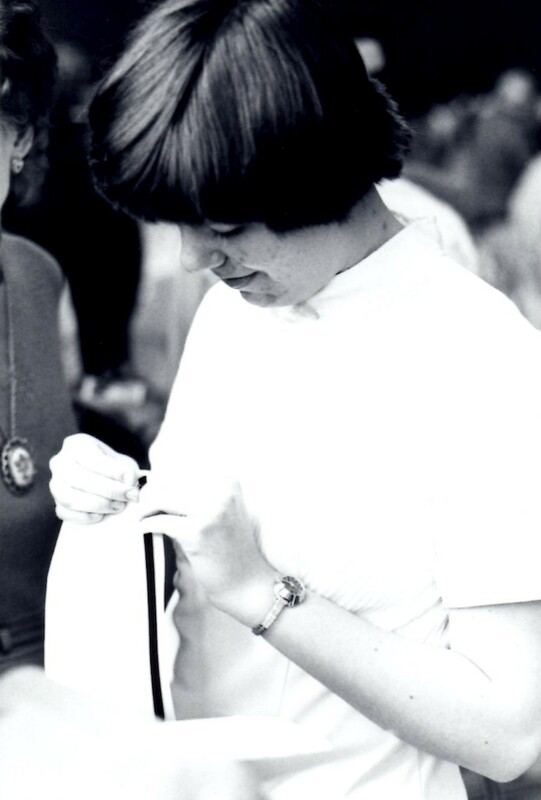 The end of January, my class had our ceremony where we received our black velvet band to attach to our nursing cap. I thanked God for his mercy and grace to me these past four years as I pinned the band on my cap. I know I only arrived at this moment with God’s help. My family traveled for two hours so they could share this special time with me. Approaching the podium to receive my band. Pinning on my new black velvet band. I almost feel like Cherry Ames with my black band! 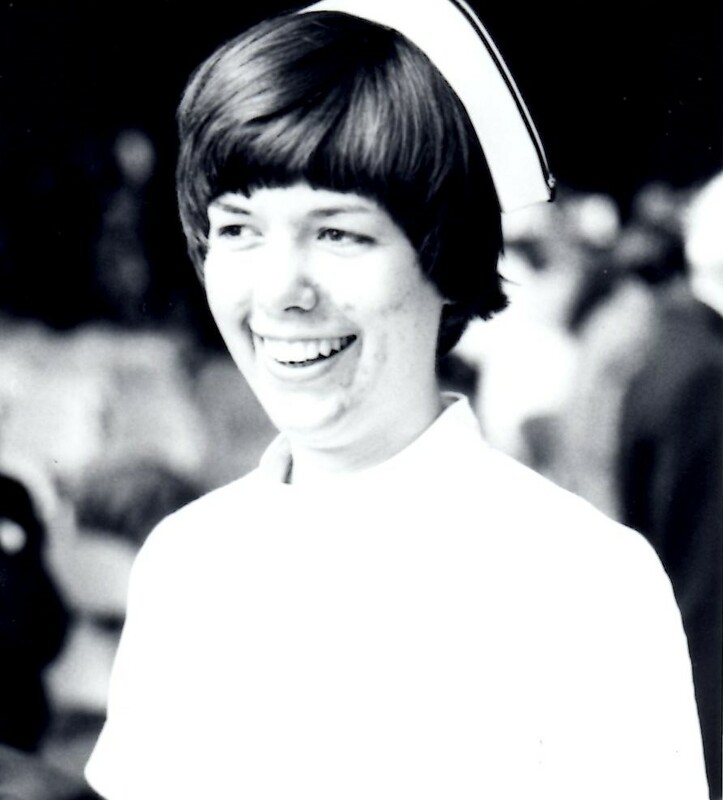 Nurses no longer wear caps in the clinical setting. It was optional to wear mine in the hospital where I first worked after graduating. I wore it very proudly at first, but as I bent over a patient to do his dressing change, it fell into the middle of my sterile field and I had to start over. I also knocked it off sometimes on the over-bed trapeze bar. There was no good way to clean it since it was made of stiff cardboard-like material. But there were some advantages in wearing it. I could easily identify which nursing school the person had attended. 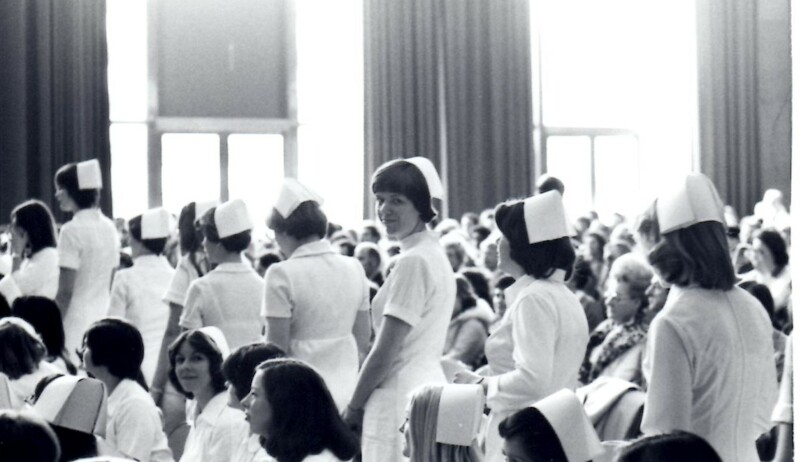 I still am fascinated when I look at old pictures of the wide variety of nursing caps! It also set us apart from the nursing assistants so the patient knew at once that I was a nurse when I entered the room. During a code for a patient emergency, it was easy to recognize who the nurse was because of the cap. I still have my slightly yellowed cap tucked away in my bottom bureau drawer. Occasionally, I gaze at it fondly and recall that proud moment when I received my black band. I had fun wearing it for a brief moment at my retirement party and at genre night at a Christian writer’s conference.